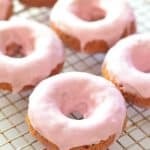 Soft & fluffy completely oil-free baked Vegan Raspberry Donuts with a smooth, pretty in pink glaze. All infused with sweet raspberry flavour & so delicious. Preheat oven to 350°F and prepare a 6 hole donut pan. Grease it if necessary. Take your defrosted raspberries and put them in a sieve over a bowl, liquid as well. Push the raspberries through the sieve with the back of a spoon. Keep going until all the liquid has passed through the sieve and what's left looks dryish. Put the seedy bits in a small bowl and set aside as you might need them later. Measure out 85mls of the strained juice. Set aside and keep any leftovers separately. Add the flour, sugar, baking powder, baking soda and salt to a bowl. In a jug or another small bowl add the light coconut milk, apple cider vinegar, vanilla extract and the 85mls of raspberry juice you measured out then stir together really well. Mix the wet ingredients with the dry ingredients. Mix only just enough that you can't see any dry flour. Do not over mix as it will affect the texture/rise of the donuts. Spoon or pipe the mixture into the donut pan being careful not to cover the middle part of it. Work as quickly as you can. Put in the preheated oven and bake for 17 minutes or until a toothpick inserted comes out clean. If you are using a muffin tin they will take about 5 minutes more. When ready remove from the oven and turn out very carefully onto a cooling rack. Leave to cool completely before glazing. When the donuts are cool make the glaze by mixing the powdered sugar with the light coconut milk until very smooth. Add the raspberry juice a drop at a time until you get a baby pink colour. You should have enough leftover juice to do this but if not, check the seedy mush in the bowl you put aside earlier as a little bit more juice will have seeped out. You literally only need a few drops to get the light pink colour and you should be able to pour it off carefully. Failing that just squeeze a bit of juice from 1 more frozen raspberry instead. Do not add too much liquid. You need the glaze to be very thick but pourable. Dip the nicely rounded side of each donut face down into the bowl of glaze then return to the cooling rack. After dipping the last donut, start again with the first. We want to double dip them to get a nice thick glaze. I highly recommend you weigh your ingredients rather than use cup measurements when making this recipe. It will ensure that you get the best results. Cup measurements vary so much and are not always accurate. Store in an airtight container. Best eaten within 2 days. I used the leftover raspberry seedy smush in a smoothie the next day along with what was left of the canned coconut milk.